Stoughton, 4 @ Norwood, 3 – Final – For the second time in as many days, Stoughton had a player record a hat trick. Loubensky Lucas netted his first hat trick of the season, a day after he scored a pair of goals and classmate Jordan Asnes recorded a hat trick against Milford. Sophomore Fabio Ponce De Leon opened his account on the season, putting Stoughton ahead 1-0 in the 10th minute of a feed from Asnes. Ponce De Leon set Lucas up a minute later for a 2-0 lead. Stoughton added two goals early in the second half as Lucas took a pass from Tyler Melo and finished from inside the area and then scored on a penalty kick a minute later. Stoughton, 2 vs. Norwood, 2 – Final – Freshman Abby Kashian and junior Emerson Sprague each scored for the Black Knights while head coach Tara Daniels said Gabby Diaz, Sarah Widrow, and Isabel Solem helped Stoughton keep possession throughout the game. Attleboro, 0 @ Mansfield, 3 – Final – The Mansfield Hornets picked up a comfortable win at home, emerging with a 25-8, 25-12, 25-14 win. Meg Hill led Mansfield with 12 kills while Julia Harrison added nine kills. Chloe Peters had 19 service points, and Anna Kemp and Jolie O’Neil each had seven service points for the Hornets. Canton, 3 @ Milford, 0 – Final – It might have been on a sweep, but it was a tight battle between Davenport foes Canton and Milford. Canton came away with a 25-16, 25-16, 25-22 win. “Both sides fought hard and played great defense,” Canton head coach Pat Cawley said. Canton outside hitter Hannah Jerrier led the Bulldogs with seven kills and Erika Lum had six kills and 13 digs. Middles Emma Murphy and Casey Shea each had four kills and combined for 10 blocks. “We played our best team defense of the year,” Cawley said, led by libero Julia Panico with 24 digs and aided by Emily Lynch and Maria Mackie, who combined for 17 digs. Foxboro, 2 @ Stoughton, 3 – Final – Stoughton and Foxboro battled back and forth but the Black Knights shut the door with an emphatic 15-2 win in the fifth and final set. Stoughton junior Val Whalen led the Black Knights offense with 20 kills while senior Christina Gelin dominated the back row with 41 digs. Senior Riley Bagley added 20 digs for Stoughton. Sharon, 1 @ North Attleboro, 3 – Final – For Sharon, junior Jess Allan led the offense with eight kills and two aces, senior Natalie Kane had 12 blocks and three kills and setters Faythe Gomolka and Arianna Chabot combined for 15 assists. Chabot also went 16 for 16 at the service line. Oliver Ames, 1 @ King Philip, 3 – Final – Click here for a recap. Franklin, 3 @ Taunton, 0 – Final – Franklin earned its third straight sweep, beating Taunton on the road. Maddie Kuzio had five aces and four digs, Lizzie Boynton had seven assists and four aces and Erin Skidmore had five kills, five digs and a pair of aces and blocks in the win. Oliver Ames, 3 @ Attleboro, 0 – Final – Cristina Boudreau and Kayla Lozzi each scored a goal and added an assist as Oliver Ames blanked Attleboro on the road. 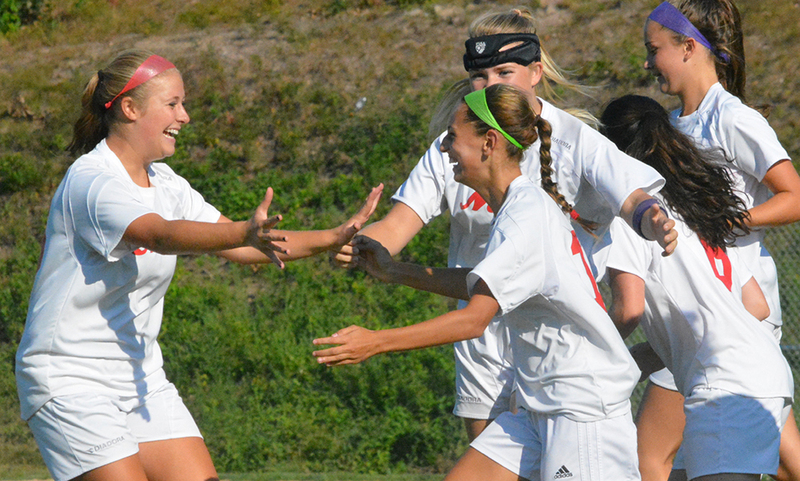 Kayla Lozzi and Liz Nuss each scored once while Rachel Stryke registered an assist. Sharon, 0 @ Canton, 6 – Final – Julia Ezepik registered a hat trick to pace Canton’s offense in the win. Foxboro, 5 @ Milford, 0 – Final – Lily Daly scored a pair of goals and had a pair of assists to lead the Warriors. Foxboro jumped out to a 3-0 lead by halftime behind both of Daly’s goals – one off an assist from Emma Daly, the other unassisted. Sophia DiCenso also scored in the first half on an assist from Lily Daly. Jenna Stamatov and Carlie Stern scored one for Foxboro and Caroline Wheatley added an assist. Franklin, 0 @ Mansfield, 0 – Final – Franklin head coach Lisa Cropper had high praise for sophomore goalie Christina Lucini, who made 12 saves to earn the shutout. “She was outstanding,” Cropper said. Cropper also lauded the effort of senior Maddie Derby, who she called “a stalwart on defense,” which included a defensive save behind Lucini. Stoughton, 0 @ North Attleboro, 0 – Final – Stoughton’s Gianna Barbosa and North Attleboro’s Liz Morehouse earned the shutouts in goal. Taunton, 0 @ King Philip, 2 – Final – Click here for a recap. Canton, 159 @ Stoughton, 181 – Final – Canton picked up another key division match win over Stoughton, led by match medalist Matt Minichiello’s 37. Jack Goyetch added a 40 while Jackson Maffeo, Joey Vaughan and Bubba McNeice each shot 41. Stoughton’s Josh Roos and Brendan Campbell each carded a round of 44 for the Black Knights. Milford, 153 vs. Hopedale, 160 – Final – Ryan Tomaso shot a 34, Anthony Arcudi added a 38 and Tylor Renaud carded a 39 to lead the Scarlet Hawks. Stoughton, 2 @ Norwood, 2 – Final – After trailing by two goals at halftime, Stoughton rallied to tie the game with a pair of goals in the second half. Jordan Asnes headed in a cross from Josh Mitchell to cut the deficit in half and then Asnes repaid the favor, connecting with Mitchell on a long throw in to tie the game. Mansfield, 0 @ Franklin, 2 – Final – Victoria Stowell scored both goals for Franklin, both off of long-range free kicks that found the top corner. Rebecca Bornstein went closest for Mansfield with a shot off the bar with two minutes to play. Stoughton, 2 vs. Norwood, 1 – Final – Emerson Sprague netted the first goal for the Black Knights off an assist from Shanel Ford and Samantha Tullis converted a penalty kick for Stoughton. Taunton, 3 @ Attleboro, 1 – Final – The Tigers qualified for the postseason with the win. Meghan Navarro had 18 service points, including five aces, and seven digs, Emily Moor had 10 kids and five digs and Lexi Natsis played well with 10 assists, 13 service points and a pair of aces. Oliver Ames, 0 @ Canton, 3 – Final – Canton picked up the 25-10, 25-15, 26-24. Elizabeth Hamilton led the Bulldogs with eight kills, nine digs and seven aces. Casey Shea had an effective day offensively, hitting .667 with no errors. Milford, 3 @ Foxboro, 2 – Final – Milford had to battle back from being down 2-1 to force a game five and took the match 25-16, 20-25, 17-25, 25-16, 15-10. Kara Halpin had 13 kills, Jill Powers had eight kills, six digs and two blocks and Allie Collins had 21 assists. Franklin, 3 @ Mansfield, 1 – Final – Franklin took a close first set and then won games three and four to get the win (27-25, 16-25, 25-20, 25-22). Dayna McCue had 47 serve receives for the Panthers, adding 22 digs and four aces. Sam Campbell had seven digs and five aces, Alyssa Shea had 10 kills and four digs and Beth Neal had 16 assists, five kills and four aces. For Mansfield, Cathryn Heavey had 36 assists and 16 service points while Meg Hill had 11 kills and six blocks. North Attleboro, 0 @ King Philip, 3 – Final – King Philip got the sweep 25-11, 25-22, 25-15. The Warriors got strong serving efforts as Emma Lopez had 11 service points in the first game, Liv Balduf had seven service points in game two, Carly Adams had eight service points in game three and Gwen Uyrus had seven service points in game three. Josie Rowean paced the offense with 16 kills while Micaela Murray had nine digs and Amanda Loewen had five digs. Milford, 2 @ Taunton, 1 – Final – Jessica Palmer setup Elena DelloRusso for Milford’s first goal in the first half and then double the Scarlet Hawks’ lead with a goal of her own early in the second half. Attleboro, 2 vs. Dartmouth, 2 – Final – Attleboro rallied from a two goal deficit at halftime to earn a point against Dartmouth. Emily Houle scored off an assist from Grace Mayer and Hannah LaMothe had an unassisted goal for the Bombardiers. 1st Quarter: (M) Diogo DeSousa 21 yard field goal; (A) Brendan Nunes 33 yard rush, Cam Furtado 2pt rush. 3rd Quarter: (M) Brian Lynch 2 yard rush, 2pt rush failed. 1st Quarter: (M) Blake Hill 7 yard rush, Sean Lehane XP good. 2nd Quarter: (M) Zach Lanzetta 28 yard pass to Blake Hill, S. Lehane XP good; (C) Dennis Ross 12 yard pass to Michael Harris, Thomas Monagle XP good. 3rd Quarter: (C) Jake Ragusa 7 yard rush, T. Monagle XP good. 4th Quarter: (C) J. Ragusa 8 yard rush, T. Monagle XP good; (M) Z. Lanzetta 48 yard pass to Leo Moronta, S. Lehane XP good. Overtime: (C) Joe Bires 5 yard rush. 1st Quarter: (F) Darren Kelly 68 yard pass to Jason Procaccini, John Cronin XP good. 2nd Quarter: (F) J. Cronin 31 yard field goal; (F) D. Kelly 18 yard pass to Connor McNamara, J. Cronin XP good; (S) Rob Bayha 24 yard pass to Craig Titus, XP good. 3rd Quarter: (F) J. Cronin 26 yard field goal; (F) Ronnie Martin 2 yard rush, J. Cronin XP good. 2nd Quarter: (T) Damion Theodule 1 yard rush, XP good; (T) Tanner Costa 46 yard rush, XP fail. 4th Quarter: (F) Brad Jarosz 1 yard rush, Nick Yelle XP good; (F) Jake Wolowacki 53 yard pass to Sam Harrell, N. Yelle XP good. 1st Quarter: (KP) John DeLuca 30 yard pass to RJ McCarthy, XP fail. 2nd Quarter: (NA) Chad Peterson 23 yard pass to Brodey Barr, Connor Flynn XP good. 3rd Quarter: (NA) C. Peterson 4 yard pass to Ridge Olsen, C. Flynn XP good. 4th Quarter: (NA) C. Flynn 30 yard field goal; (NA) Kyle Gaumond 39 yard interception return, C. Flynn XP good. 1st Quarter: (S) Christian Hill 42 yard rush, XP fail. 2nd Quarter: (S) Ryan Sullivan 13 yard rush, 2pt fail. 3rd Quarter: (OA) Charlie Ryan 50 yard pass to Steven Scurti, XP good; (S) Guy Eddy 20 yard rush, 2pt fail. 4th Quarter: (OA) Liston Funai 4 yard rush, C. Ryan pass to Connor Moroney 2pt good; (S) G. Eddy TD rush, C. Hill 2pt rush; (S) R. Sullivan TD rush, R. Sullivan XP good. Stoughton, 1 vs. Norwood, 2 – Final – Stoughton’s lone goal was a header from freshman Fabio Ponce De Leon on a cross from Jordan Asnes. North Attleboro, 3 @ Durfee, 2 – Final – Junior Shannon Kingsley set up Felicity Monfils for North Attleboro’s first goal, which came in the first half. Monfils picked up another point, assisting on Hana Caster’s goal and Haley Guertin set up Leah Jette for the game-winner. Stoughton, 2 @ Norwood, 0 – Final – The Black Knights broke into the win column behind a pair of goals from Shanel Ford. Ford netted her first off a cross from Emerson Sprague while Samantha Tullis set up Ford’s second goal. Alecia Quinones picked up the shutout in net, making 16 saves. Mansfield, 3 @ Franklin, 1 – Final – Mansfield picked up wins in the first two games and finished it off in the fourth game. The Hornets took a 25-9, 25-21, 24-26, 25-18 win behind 10 kills from Meg Hill, six kills from Colleen Riley and 13 digs from Cathryn Heavey. Franklin’s Caroline Maguire had three kills, three blocks and a pair of aces, Aubrie Kutil had six kills and Dayna McCue finished with 22 digs and three aces. King Philip, 3 vs. Bishop Feehan, 1 – Final – King Philip picked up a 23-25, 25-10, 25-22, 25-15 non-league win over the Shamrocks. Josie Rowean had 18 kills and four aces to pace the Warriors’ offense. Micaela Murray added eight digs and Carly Adams led the team in assists. Head coach Kristen Geuss said Liv Balduf and Sydney Phillips did a good job blocking for KP. Stoughton, 3 @ Fontbonne Academy, 0 – Final – Stoughton senior setter Bianca DeSousa had seven kills, 11 assists, seven digs, 13 service points and six aces to pace the Black Knights. Senior Bridgette Whalen added eight blocks, five kills and six digs and junior Christina Gelin had nine assists, 10 service points and five digs. Stoughton won 25-11, 25-18, 25-21. Franklin, 1 @ Taunton, 0 – Final – Franklin senior Kelsey McPhee scored the lone goal of the game while Panther goalie Samantha Jones have a big save on a breakaway to preserve the lead. Head coach Lisa Cropper said seniors Abby Egan, Maddie Gendreau and Kenzi Pleshaw all played well defensively. Franklin, 171 @ King Philip, 156 – Final – King Philip’s Mickey Riley was the match medalist, shooting a 37 to lead the Warriors. Matt Dao shot a 40 for the Panthers. Stoughton, 179 @ Oliver Ames, 145 – Final – Steven Tasho carded a match low 35 for Oliver Ames while Nick Lombardi shot a 36 and Brian Lambert and Jack Green each shot a 37 for the Tigers. Jamel Husseini carded a 43 for the Black Knights. Taunton, 148 @ New Bedford, 185 – Final – Kaynel Gonsalves shot a two-under 34 to pace Taunton while Ryan O’Berg shot 36 and Mike Volkmann and Justin Proto each shot a 39.